*** WINNERS *** Kathy, Nurinia, Klydra, Sally and Seyma are Living the Life of Riley! CONGRATULATIONS! I want to give a big and hearty CONGRATULATIONS to Kathy, the winner of the ECCO Clay Strap Shoes in Cocoa Brown! Kathy now has 48 hours to confirm! I also want to give a big and hearty CONGRATULATIONS to Nurinia, the winner of the Mondetta Signature Soccer-Themed Pitch Jacket! Nurinia now has 48 hours to confirm! I also want to give a big and hearty CONGRATULATIONS to Klydra, the winner of the PicturesonGold.com Sterling Silver School Protect Medal! Klydra now has 48 hours to confirm! I also want to give a big and hearty CONGRATULATIONS to Sally, the winner of the $50 Gift Card to Stride Rite! Sally now has 48 hours to confirm! I also want to give a big and hearty CONGRATULATIONS to Seyma, the winner of the 100% Juice 100% Fun Prize Pack! Seyma now has 48 hours to confirm! 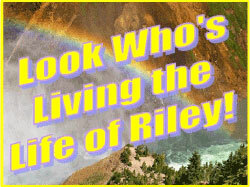 *** WINNERS *** April, Margaret, KJ, Reese and Andy are Living the Life of Riley! CONGRATULATIONS!